1) Configure Viewer and Parser. • Select "Alternating Background" to distinguish rows by alternating shading. Otherwise you can select a background color of the table. • The "Grid Style" determines if vertical and/or horizontal lines will be drawn to separate rows and columns. You can also select the color of the grid lines. • The file is parsed according to the value of the separator. If the file is not comma or tab separated you can specify another character by selecting "Other" from Separator menu and then entering the separator character in the adjacent text field. • If the file has quoted text strings the parser can remove these quotes by selecting the "Remove Quotes" option. • nView is intended for displaying rows of data which all have the same number of entries (columns) as the first row. If rows are encountered that do not meet this criteria the parser will skip those rows, and display an alert when parsing is complete. Turn off the feature by selecting "Don't Show Alerts." 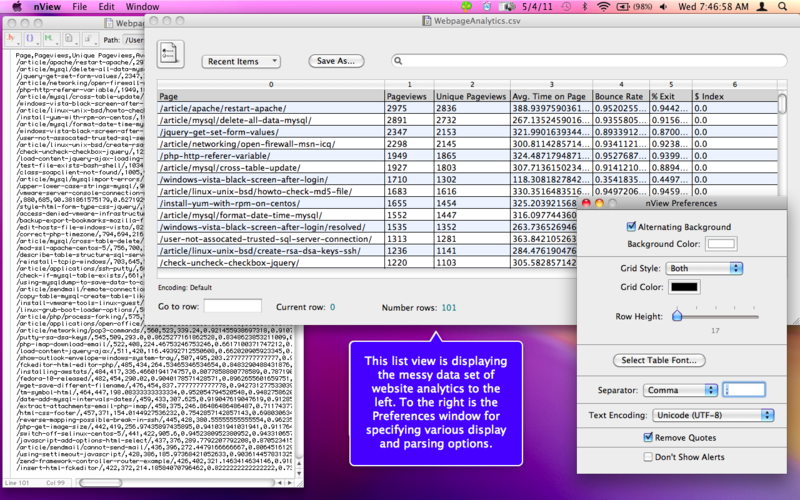 Either select "Open..." from the File menu or drag a file from the Finder into the application's viewer window list view. Processing begins immediately. The lines must be separated by carriage returns (CR), line feeds (LF) or both (CRLF). Once the file is processed you can rearrange columns and adjust their sizes. • List Area. This is where the data is displayed. Point your mouse at a specific row to see its position in the list. At the top of each row is a row header indicating which field it represents. Click the column header to sort the rows using its values. Drag column headers to rearrange the columns. You can edit values in the table. To do this double click on a field entry to create an edit field. • Recent Files Popup. This menu shows all the files you have processed since you last cleared the menu or opened the program for the first time. Select an item to process it again. • Save As. Click this button to save the data to tab delimited text file. • Search Field. Enter some text into this field and press return to go to the next row that contains this text. Repeatedly press return to cycle through all rows that contain the search term. Note that the rows are selected as they are found. • Go to Row Field. Type a number of the desired row number and press return to go to that row.